The Lynn Memorial Auditorium is located in historic downtown Lynn, Massachusetts within Lynn City Hall. The Auditorium was built in 1949 and was renovated in 2005-2007. The main hall accommodates 2,112 people. The Lynn Memorial Auditorium is the North Shore's oldest yet newest premier entertainment venue and is once again available for rent! From small dance recitals to major A list acts and performances the Lynn Memorial Auditorium is back on the map ready to sell out your show! 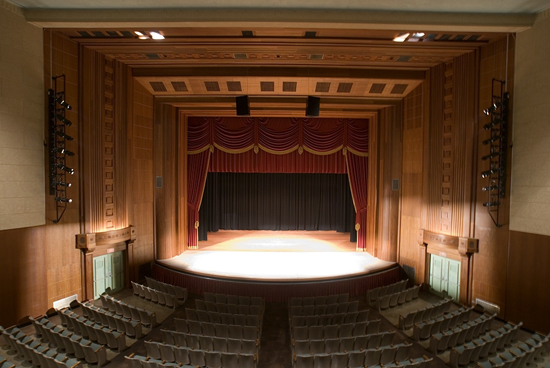 Occupying the core of the Lynn City Hall on all four floors, the auditorium is composed of orchestra and balcony seating, the stage, an orchestra pit, a projection room and dressing rooms. Total seating capacity is 2072 with 1245 seats in the orchestra section and 827 in the balcony. The dimensions of the auditorium are 120 feet wide across the entry off the foyer, 40 feet wide across the proscenium arch, and 93 feet deep from the entry to the orchestra pit. STAGE | The stage is 80 feet wide and 30 feet deep with a floor of Douglas fir with a straight, brick back stage wall. The entire height of the stage area is 45 feet. The Proscenium is 40’ wide X 45 ‘ in height. The Wings measure 20’ for stage left and 20’ 7” for stage right. Spiral stairs lead to the upper stage where the original control panels for lighting and hoisting scenery are located. A catwalk studded with lights and pulleys soars above the stage. As is typical in an auditorium, the orchestra pit, 38’ wide x 15’ 2” deep at center x 4’ 10” high. (7’ 2” to top of retaining railing), is depressed in front of the stage. Other features include: Apron - 0’ 0”, Grid - 47’, Fly - 47’ and Stage Rigging - 20 Sets X 63’ long. POWER | 400 amp, 3-phase, 120/208 volt company switch with capacity to #4/0 copper cam lock access connectors 200 amp, 3-phase, 120/208 volt, circuit distribution panel board with circuit breaker access. SOUND SYSTEM | 6’ Steel locking cabinet with Allen & Heath rack mounted 14:4:2 Mixer. 40’ 6 input microphone snake can connect to microphone input panel located in bottom of cabinet or microphones can be connected directly to input panel. A 40’ stage monitor snake with (2) JBL MP212 monitors. (2) Dynamic microphones and stands. A hand held wireless microphone and a head worn wireless microphone system. (2) OAP 2 speakers flown above stage and (4) OAP UB622 speakers for under balcony fill. The sound system consists of 4 FBT Max4a 300 + 100W – Processed Active monitors and 4 FBT MaxX 9Sa Subwoofers and are stackable together and a Mackie 1202-VLZ Pro 12 Channel Mic / Line Mixer. PROJECTION ROOM | The Projection Room, 27’ long X 9’ wide with bathroom, is 130’ from the stage. Projection equipment includes an Eiki Model LC-XT3 Theater Style Projector, including long-throw lenses, with the ability to connect to DVD Player, Computer, VCR or TV and a Toshiba DVD Player for presentations. The projection room also houses two Orbiter long-throw follow spots. The auditorium has two screens. One is a Super Glo Movie Screen at 23’ 3” wide X 17” high and 130’ from the projection room and a stretch fabric screen at 34’ wide X 39’ high plus or minus 2’ on the stretch. DRESSING ROOMS | One large and ten small dressing rooms plus orchestra and chorus rooms are located beneath the stage. The Orchestra Room is 22’ x 16’ with sink and the Chorus Room is slightly smaller. The main dressing room is 22’ x 16’ with sink, shower and lavatory. A typical dressing room has brick walls painted beige as a dado and white above. Each of the ten smaller dressing rooms measure 8’ X 9’ and can accommodate 2 people with a sink, mirrors and dressing table. One six­-pane window provides natural light and each room is equipped with a wall-mounted sink and dressing table with mirrors. Additional tables and chairs are available. Lynn City Hall is equipped with two all passenger elevators. Box Office facilities are available with ticket master accessibility. Visit Our Video Clips Archive! Concert Movie Night Schedule 2019 !